In the last 20 years or so, the way in which companies do business changed immensely. Advancements in technology and globalisation created an integrated global community, which consequently allowed businesses to trade internationally within seconds and easily acquire foreign customers and partners. Although the nature of business itself changed significantly, now allowing companies to approach their new, potential customers with a moderate ease, human nature and many consumer behaviours have not changed in the least. Although people are today more aware of international trends and can be affected/persuaded by foreign tendencies, a number of local preferences and aspects which can directly affect their behaviours as customers remain the same. According to a recent study, more than 50% of all consumers feel more motivated to committing a purchase if the information about a product or service is available in their native language. Similarly, when dealing with potential business partners, knowledge of their language and culture can often go a long way and prove to be extremely beneficial during negotiations or business consultations. These statistics only emphasise just how important translation services truly are in today’s modern business environment. The world today isn’t as big as it used to be, at least in the metaphorical sense. Due to globalisation and technology developments, languages became a key aspect of our lives, both the personal and professional. A rapidly growing number of businesses and organisations now truly begin to appreciate the value bi-lingual and multilingual employees can offer. And while such employees can be an extremely valuable asset to any company in terms of the day-to-day operations, approaching foreign markets and international consumers on a larger scale requires an experienced translation agency to convey the company’s message in a professional and a culturally-appropriate way, which considers a number of factors affecting the translation. The growth in the number of businesses requiring professional translation services is clear to see, and as our translation agency in London works with UK as well as international organisations, we are able to see this first-hand. As languages are today one of the key aspects of globalisation, we decided to take a closer look at some of the languages which we believe will be most prominent and beneficial within the business environment in 2019. Chinese Mandarin is the world’s second most commonly spoken language, consequently allowing businesses to approach almost 1.2 billion potential customers, including 1 billion native and 200 million non-native speakers, making up an astonishing 15% of the world’s total population. The Chinese economy is continuously growing, already being one of the largest economies in the world, and it is predicted to overtake the U.S by 2028. Additionally, customs and traditions are extremely important in the Chinese culture and this also reflects on the business environment. Understanding the language and culture will be extremely beneficial when dealing with Chinese consumers and business partners. These factors make Chinese Mandarin one of the most important languages to learn in 2019. Spanish is one of the most widespread languages in the world. You can find Spanish speakers in Europe, Americas, Asia and even in Africa. covering over 20 different countries and 500 million speakers. A study by the British Council revealed that 35% of UK businesses find employees who are able to speak and understand Spanish extremely useful to their organisation, due to fact that a number of the fastest developing countries in the world use Spanish as an official language, and therefore allow the businesses to approach those markets and partners based abroad. Portuguese is an important language to consider within the business environment mainly due to one of the world’s fastest growing and developing economies – Brazil. With over 215 million speakers worldwide and a doubled number of imports/exports within the last 20 years in Brazil, in 2019 Portuguese can be an extremely significant language. When learning Portuguese, it is important to remember that, similarly to Spanish, the European and South American versions of the language can differ slightly in terms of grammar, pronunciation and even some vocabulary. More than 50 countries worldwide recognise English as their second language, and over 350 million people considers English as a native language. Businesses which incorporate English into their campaigns will be able to approach more than 1.5 billion people – and that’s around 20% of the world’s entire population! Despite Brexit and some political uncertainty, English still remains a core business language in Europe; partly because of its simplicity and partly because of its universality – English allows companies and businesses to communicate efficiently across a number of different sectors. 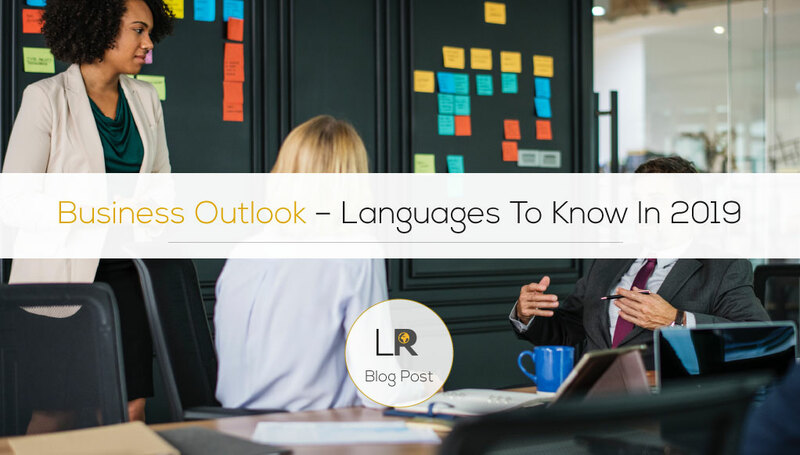 Languages mentioned in this article will, without a doubt, play an important part in the business environment in 2019. For both; the employees – knowing these languages will help in developing their careers further, and also for companies – approaching some of the fastest growing markets and economies in the world – whether with the help of a professional translation agency, or one of their multilingual employees, will allow them to grow an international customer base and build a strong presence abroad.